You know how it is once you return from home. You may be back to your regular, mundane life, but you are actually not back yet. A part of you is still back home, chatting with your parents till late at night, all three of you yawning, but no one wants to break up the chat because you are there for a precious few days. Waking up in the morning to the smell of freshly made tea and a breakfast of kochuri, choler daal and jilipi. People calling you up on the telephone, the same old conversations, but it feels oh so good to hear the voices of near & dear ones. Standing in the balcony with my mother, discussing the changes happening in our neighbourhood. The same landmarks of the city whizzing by as my father drives his car and you getting excited. Your parents telling you what has changed in the city, the new things happening. The long list of shopping, the must buys, trying to juggle as many shops as possible in that very limited time. Insisting on eating at your old haunt, even when you savvy cousin warns you and then feeling disappointed. Home for me are my parents and also my city. I can never think of home and leave out Kolkata from that memory. The city and the home are mixed up in my mind in a tangled web. And I am happy to let it be. Of course when you are in such a mood, you crave food from back home. No fancy food, cos you have been eating that a lot for the last few days. Simple, homemade staples. Made a big pot of egg curry so that it will last us a few days, sparing me the trouble to cook. Egg curry is very popular in all parts of India and the version varies depending upon the location and the spices used. Not only that, it is a staple on Indian Railways and an egg curry meal is something people have regularly while travelling from one part of the country to the other, as the train sways one way then another and your neighbour's radio gives the latest score of cricket match. It is also a popular cafeteria and canteen food. It is generally cheap and tasty, and deemed safe to eat cos meat or fish quality may be debatable but eggs are considered a safe bet. 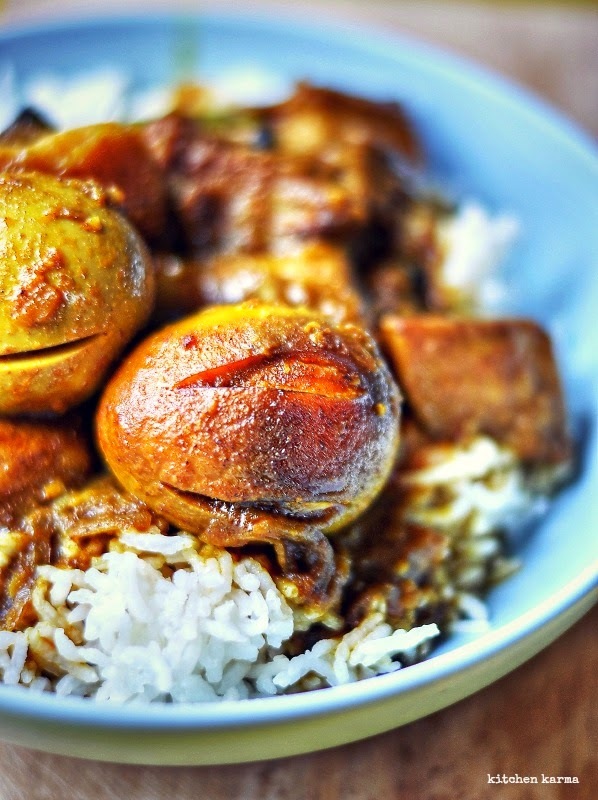 This egg curry is made the Bengali way. I have grown up eating this curry with rice for lunch or for dinner with rot is. Mothers make this during the month end when they are short of cash or fish or meat is too expensive. It is generally considered second grade to meat and fish curries. But by all. My egg crazy husband swears by egg curries and often chooses it over fish and meat. Wanted to share the recipe with you as well, one of these days soon. The close up pic of dimer dalna looks so delicious and mouthwatering. Excellent pics as well. Tempting pic,making us wait for the recipe! Welcome back! Its so hard to leave home and your parents isnt it? I know the feeling! Food is such a perfect bridge and so comforting! Big hug and the egg curry looks so divine ! Hey there Suchi, i haven't left a comment here in a long time but had been following your one-a-day food photos. Finally came here to ask you why they stopped. Waiting for more. Hope you are doing well. Ohh su huevo curry es irresistible me encanta,abrazos. Thanks for dropping by mine. Your newest follower is here. I have never had egg curry before. I would love to have a recipe.